around your home. After birth your baby will recognise your voice and prefer it to any other voice. 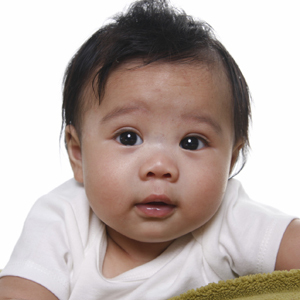 Babies learn language through frequent interaction when you talk to him and read him stories. this way to their newborns and as they grow older adapt to a more normal speech pattern. Talk to your baby as much as possible when she's awake. Use common, everyday words over and over, and point to objects as you name them. The baby's fine, how are you? support and understanding from the people around you. Sometimes, however, these unhappy feelings become so intense that you feel overwhelmed and out of control. If this happens, you may be suffering from Post Natal Depression (PND) and you should contact your doctor as soon as possible. produce a raised or flat red, purple or blue mark. expands and get darker as the child gets older. known as angel kisses. They usually fade within 6 months. A pigmented birthmark occurs through a skin abnormality that produces melanin. Mongolian blue spot – a pale blue/black patch resembling a bruise that is found on the lower back or on the shoulder. They usually disappear with time. Café-au-lait spot – a brown patch that can be found anywhere on the body. They are usually permanent and could expand. Moles – can be flat, raised or hairy and found anywhere on the body. If a mark is in an obvious place or otherwise worries you, talk to your doctor about it at your baby’s next check-up. It may be removable at a later stage, or be nothing to worry about.